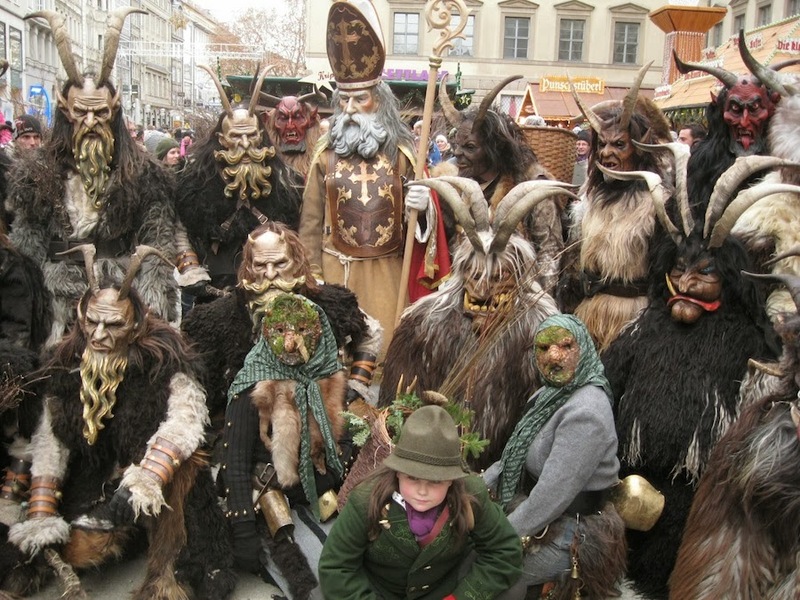 Krampus Group in Munich. Photo: Al Ridenour. Krampus Los Angeles Troupe. Photo: Phil Glau. Postcard from Monte Beauchamp’s collection. Following is a guest post about about friend of Morbid Anatomy Al Ridenour's attempts to revive the art of "Krampusfest" in his hometown of Sunny Los Angeles. Al is part of a group of medical art-themed provocateurs called Art of Bleeding; more on them here. Maybe we can persuade Al to stage Krampus fest here in NYC next year? For more on Krampus and his history, click here; to find out about the Morbid Anatomy Krampus costume party (!) on December 14th, click here. To order Krampus holiday cards of your very own, click here. As the Morbid Anatomy’s annual Krampus celebration approaches, I’ve been invited to share a bit about how we here in the relentlessly sunny city of Los Angeles are now also falling under the shadow of an ancient Alpine devil. While perhaps the most overweening, we are not the first American Krampus troupe. That credit goes to Philadelphia Krampuslauf, now in its third year. Groups in Portland, OR, Detroit, Athens, GA, Bloomington, IN, and New Orleans are also now part of this burgeoning movement. 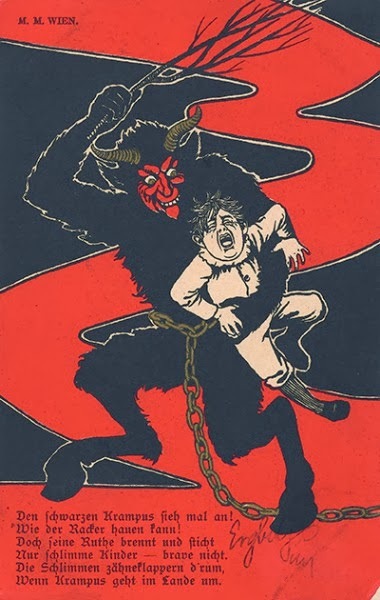 Much of this began in 2004 when collector Monte Beauchamp began baiting us with his lovely series of books documenting the popular Krampus cards that circulated in earlier centuries. What pushed me over the edge, however, was the discovery of European videos that presented the Krampus not as a antiquated ephemera, but a tradition still very much alive and ready to chase you down the street. Pouring over online footage, I concluded that the scenes shot in the Gasteiner Valley near Salzburg seemed the most unrestrained and boisterous, so that is where I convinced my wife we needed to go. Returning to my hotel giddy from my first night of live Krampus tussling, and with snow still wet in my hair, I opened the fateful email message announcing the creation of an LA Krampuslauf. It came from Al Guerrero, a fellow organizer and co-conspirator of the Los Angeles lodge of The Cacophony Society, a national group dedicated to eccentric mischief which flustered journalists of the 1990s came to define as “culture jamming” and “flash mobs.” We’d never sported horns or wielded switches, but had honed some guerilla theater fly-by-the-seat-of your pants spectacle-making skills. Krampus didn’t seem like a big jump. Each of our suits did end up consuming sizable investments of time and money. Many of the costumes were sewn weft-by-weft, and the masks sculpted from scratch and topped by real animal horns. Right now there are about 15 of us, and we’re looking forward to meeting more recruits at our public Krampus run. The troupe will also storm in on some less traditional indoor events, including our Krampus Ball and Krampus Rumpus, themed shows juxtaposing performances of traditional Schuhplattler dances and alpenhorn solos by a local Bavarian cultural group with acts like Santa Claus Nomi (the band Timur and The Dime Museum working with former Nomi composer Kristian Hoffman) as well as horned and pelt-wearing parody bands including The Kramps, Krampwerk, and Krammpstein. And there is a group exhibition at Santa Monica’s Copro Gallery displaying Krampus-inspired artwork by a horde of artists including Chet Zar, Bob Dob, Luke Cheu, Travis Louie, and even Tim Burton. For this event, Krampus LA will contribute a performance and outdoor “Krampus Habitat” installation omplete with cages, screaming children and hellish photo-ops a-plenty. One of our purposes in creating this crazy patchwork of events was to offer an unfamiliar public different ways to dip their toes into a new tradition. Not everyone can dedicate the resources to creating traditional costumes, but we’re hoping that some uncostumed attendees at this year’s events will be inspired to return to us next fall for workshops geared toward making traditional costumes. Maintaining the core traditions under the camouflage of Californian kookery is important to us. Toward that end, we’re also reaching out to European groups, and have befriended a couple participants from different communities around Salzburg. Having previously planned trips to California, we met with each of them for informal Q and As. They were both surprised and initially perhaps a bit baffled at our enthusiasm and efforts toward creating costumes imitating their homegrown traditions. Usually things run differently. 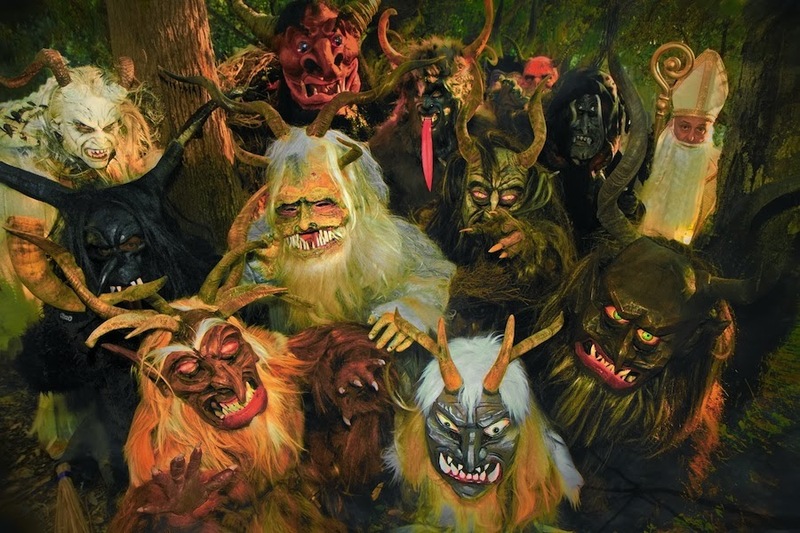 For many Europeans the obliteration of local holiday customs by the ever-expanding presences of the American Santa Claus, (“Weihnachtsmann,” i.e., “Christmas Man” in German) is a hot-button issue, so amid all our chaotic street devilry, we hope our group and other American Krampus enthusiasts might be tipping the scales a bit toward a happier equilibrium. KRAMPUS NIGHT III - A DAMNED Holiday Benefit Spectacular, Anti-Holiday Animatronics Exhibition & Artist Bazaar!! !